Shirts With Random Triangles: Mississippi State adds Alabama high school defensive lineman Kendell Jones to its 2015 recruiting class. 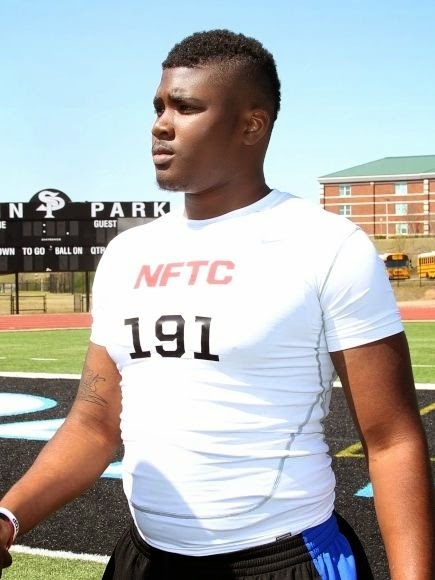 Mississippi State adds Alabama high school defensive lineman Kendell Jones to its 2015 recruiting class. Kendell Jones. Photo via 247Sports.com. Mississippi State had a busy Thursday. Pinson, Al high school rising senior defensive lineman Kendell Jones was one of three rising seniors to commit to the Bulldogs on Thursday. Jones is graded by Rivals.com as a three-star strongside defensive end. He attends Clay-Chalkville High School in Pinson, Al. He stands 6'4", and weighs 250 lbs. Jones joins two other rising high school seniors, Alabama cornerback Maurice Smitherman and, and Tennessee quarterback Nick Tiano, who also committed to Mississippi St. on Thursday.